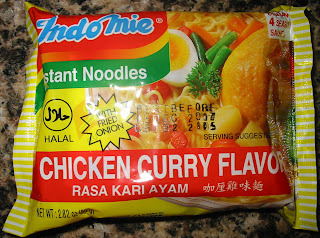 Here comes yet another flavor from Indomie. I think their strategy is to package all possible combinations of their huge array of flavor packets and call them each a new flavor. In some cases, such as Indomie's Mi Goreng, this is highly successful. 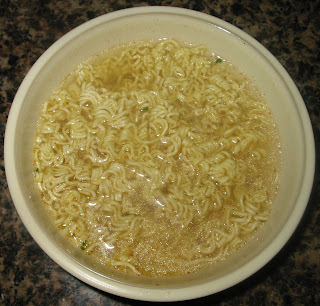 In other cases, such as this one, the broth really lacks any distinctive quality. 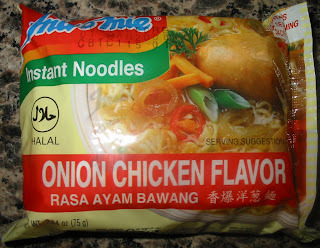 In a word, I would call these noodles bland. I was disappointed that Indomie didn't include fried red onion, since they are known to do this in their instant noodle packages. The broth tastes a little bit like onion and a little bit like chicken but it is not very strong. After my first sip, I realized that these noodles were practically begging for a healthy dose of Sriracha sauce. I was happy to oblige them and turned the broth a fiery red color. If you are not familiar with Sriracha sauce, I highly recommend you pick up a bottle at your neighborhood Asian grocery store. These noodles provide a perfect backdrop for Sriracha sauce because they are very plain on their own and need an additional kick to liven them up. On their own, I would definitely not recommend these noodles but they taste pretty good with a big dollop of Sriracha. Thanks to 99 Ranch Market, I have recently discovered the very wide range of flavors that Indomie offers. One of those is Chicken Curry Flavor. The packaging proudly indicates that this pack now comes with fried onion. The instructions indicate that the fried onion is to be added right at the end as a garnish. This pack of noodles comes with 4 seasoning sachets. I've passed the point where I am impressed by Indomie's high number of seasoning pouches and see it just as an annoyance. The flavor of the broth is remarkably similar to the Mie Sedaap Jelas Terasa Sedapnya. It is a mix of lemon and curry with very little chicken taste. The lemon flavor for the curry is a little bit unusual for someone that is more used to the spicy Indian-style curry. I am guessing that this is the Indonesian style of curry rather than the Indian or Western styles. The fried red onion is a nice finishing touch to these noodles. As I have noted before, Indomie's noodles are nothing special and they usually rely on complex flavoring to provide the majority of enjoyment. For me, the curry was a little bit strange but I'm sure that people that prefer this style of curry will enjoy these noodles. When I cooked these noodles and started eating them, they seemed a little familiar to me. It turns out I already blogged about them about a year and half ago! I decided to write a review anyways, though, in case my opinions had changed. I would like to mention that these are quite similar to the Unif Tung-I Instant Rice Noodles - Chinese Onion Flavor that I tried recently. As you might expect, the only difference is in the noodles themselves. 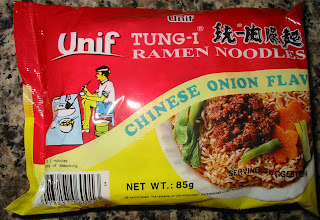 I am very familiar with Unif Tung-I's ramen noodles and I consider them to be a typical example of Taiwanese instant noodles. They have a nice nutty flavor and are deeply fried, which gives them a crispy brittleness out of the package that you wouldn't see out of Korean, Japanese, or other common instant noodles. 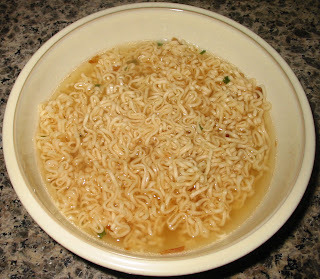 However, upon cooking, the noodles become extremely soft yet keep some of their nutty flavor. I happen to enjoy Taiwanese instant noodles, but definitely don't expect the chewy noodles that you would find in Korean, Japanese or American instant noodles. 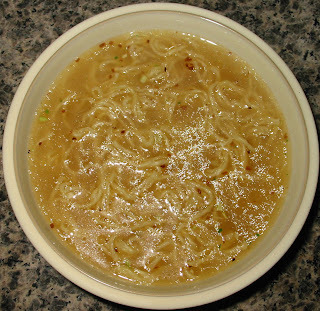 The broth for these noodles tastes salty and mild with a firm onion flavor. It is subtle and there is not a lot of flavor, but the taste is still satisfying and inoffensive. If you like fried red onions, you will like the flavor of these noodles. 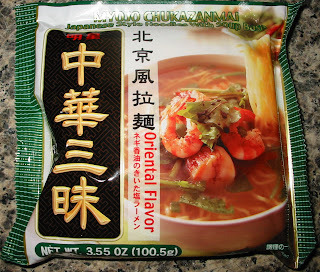 These instant noodles are a decent snack if you are looking for something that will not overwhelm your tastebuds. One and a half years later, though, I think I've discovered some better options that you could treat yourself to! Myojo Chukazanmai is one of those brands that fans of fresh Japanese ramen really enjoy. I was really surprised to see that this brand had an "Oriental Flavor". Usually, you'd only see that flavor applied to a generic Asian-style broth for a really cheap instant noodle like Cup Noodles or Maruchan Instant Lunch. I would have figured that Myojo Chukazanmai could have picked all their flavors out of the pantheon of Japanese ramen flavors, including Shoyo, Shio, Miso, Tonkotsu, and countless others. I really had no idea what this broth was going to taste like, since it was marketed only as the generic "Oriental Flavor". It ended up tasting like garlic and sesame, which was quite nice. There was also a slight flavor of creamy nuttiness, not unlike what you would get in a Tonkotsu broth. The noodles in Myojo Chukazanmai's offerings are thin and chewy and seem undercooked despite how long you cook them. They are not fried very deeply and are similar to the fresh noodles you would get in a ramen restaurant. They also taste a little bit starchy, which helps add to the "fresh ramen" taste. Altogether, this was a decent bowl of ramen. 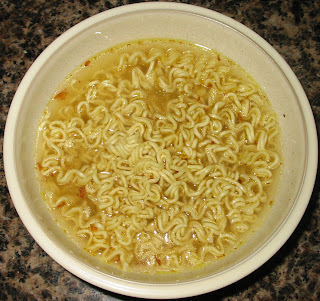 To be honest, I prefer the more "instant" tasting ramen noodles. In other words, the ones that taste like they have been fried in palm oil. I'd leave the fresh ramen to the places that actually make it fresh! But if you are in a place where you just can't get access to a ramen restaurant, then I would recommend this to you when the craving strikes.